There are a handful of blogs that I check religiously.. its true, I'm Evan and I'm a blog junky. I just love reading about everyone's adventures in the kitchen, their beautiful photos, inspiring foods..it's addicting; It's my little escape every afternoon while at work. While the rest of my office spends their extra time checking out facebook and ESPN, I'm on foodbuzz checking out blogs. I'm often inspired by many of the bloggers I follow..I'll see a dish and think 'Oooh I could do that and change a little of this or a little of that' and voila! a recipe is created. A couple of days ago I did just this.. I found myself drooling over Chef Dennis' Apple and Peach Crostatas at More than a Mount Full and couldn't stop thinking about them all afternoon. I had never made a crostada and he was just the inspiration I needed. I didn't want to completely copy him though, so I found my own recipe and changed the ingredients a bit. 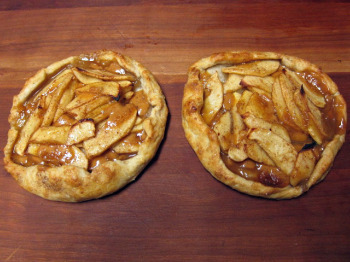 In sticking with the Fall theme I made Caramel Apple Crostadas. I'm a big fan of individual desserts and didn't want to worry about leftovers, so I opted to make two individual crostadas instead of a large one. This recipe is for a 9-10inch crostada, so I used half the dough to make two smaller versions and saved the other half of dough in the freezer for later. 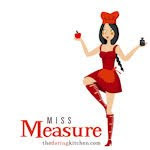 In a food processor, add flour, sugar, cinnamon and salt- pulse a couple of times to mix. Add cold butter, pulsing until just combined. Slowly add water, pulsing until crumbly/clumpy consistency is reached- add more water if dough doesn't start coming together. Turn out dough on lightly floured surface and continue to knead with hands for a few minutes (the consistency will be much like pie dough). Form dough into disc, cover with saran wrap and place in fridge for about 30 minutes. 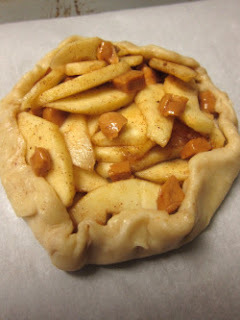 In the mean time, start making apple filling. Place prepared apple slices in a bowl. Mixing with hands, evenly coat apples with cinnamon and sugar. Fold in pieces of caramel. On a lightly floured surface, roll dough into 9-10 inch disc. *If making individual crostatas, cut dough in half- wrap second half with saran wrap/foil and place in freezer. Cut dough again, making 2 smaller crostatas- forming two discs about 4-5 inches wide. Place circles of dough on prepared baking pan. Pile apple/caramel mixture in center of dough. Fold dough over apple mixture about 1-2 inches. Pinch your folds to seal dough. Brush exposed crust with half and half or milk. 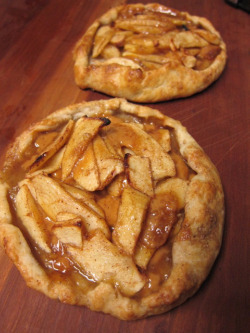 *Remember that your crostata is not going to look perfect... it's supposed to be rustic! 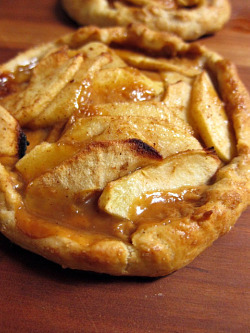 Place crostatas in﻿ oven and bake for 25-30 minutes or until apples/caramel start oozing. Allow to cool for a few minutes before devouring! Serve with vanilla ice cream or frozen whipped cream.